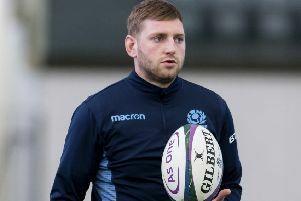 An Australian journalist has made a bold claim that Scotland playmaker Finn Russell could become the bestNumber 10 in the world - if he doesn’t already have it. Paul Cully, writing in the Brisbane Times after Scotland’s historic 54-23 victory over Australia at BT Murrayfield on Saturday, described Russell and his ‘excellent halfback partner Ali Price’ as ‘instrumental’ in the Scots’ win. Cully continued: “Is Finn Russell the world’s best Number 10? It’s a title the Scotland playmaker can realistically hope to attain even if he doesn’t have it now. “When [Sekope] Kepu was sent off, [Russell and Price] upped the tempo, with Price showing off his deceptive strength to dot down and then Russell taking a quick tap to set up Huw Jones. “Conor Murray and Johnny Sexton were impressive as Ireland beat Argentina, but Russell has a bit of magic about him that makes him a joy to watch. Russell has scored 109 points in 32 appearances for Scotland, after breaking into the international set-up in 2014, making his debut against the USA in Houston during a summer tour of North America.